Ooooh! I just had a quick scroll through your nice foodie blog! Now I'm starving! I'd love to have a slice of that English muffin bread! So nice that you stopped by! Thanks, Jacqueline! I hope you'll stop by again soon. Theresa, thank you! I served these last night to guests who had never had caramel cake before, and they were intrigued by the flavor. Ooh, less sweet frosting, with excellent holding power when piped or swirled onto the cake or cupcake? You won me over right away. Next time we need a cake, this is the frosting for us. Natalie, thank you so much! I think the caramel flavor goes especially well with banana, carrot, and any kind of spice cake. Let me know how it turns out for you! 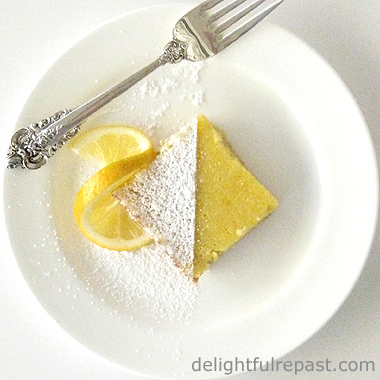 I'll have to try this with apple cake! Ooh, yeah, that would be perfect, Jacqueline! ohh this wounds so good - I LOVE caramel frosting!! what a great recipe! Mary, thank you! I hope you'll try it soon. Thanks, Amy! Which show was it? I rarely see any cooking shows (or any TV shows) because I don't have television. Shocking, isn't it?! 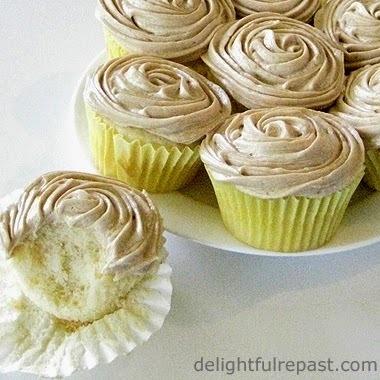 I've never heard of flour frosting, but I don't like buttercream At All, so this is something I'd really like to try! No electric mixer, though...do you think just beating it by hand will make it anywhere near light enough? Why, why, why!?! Y? Caramel frosting. I’d managed to forget it. All these years, but now you’ve awakened those latent taste buds dedicated to the memory – the reality! Oh, Yum Yum. I need some caramel frosting. This is not going to end well. And your elegant, sensory, seductive prose is tantamount to cruel and unusual punishment. However, I have just enough integrity to be objective…5 cleavers! Quinn, do you not have a little electric hand mixer? How about an old-fashioned non-electric rotary beater? I don't know if you could just beat this with a spoon for a long time. If you try it, let me know how it works for you. Or I might try it next time. It all depends on whether you have the "arm" for it. I no longer do! Sully, I'm always so honored when you award me 5 cleavers! I'm not even a frosting lover, but I think I could just eat this stuff with a spoon! I've never heard of or had flour frosting...it sounds and looks very delicious, Jean. You did a great job creating those beautiful swirls. Thank you, Angie! You make such lovely things, too! This looks stunning!! I've never heard if this kind of frosting before but you describe it so beautifully I am intrigued. I'm due to make a cake this weekend so I may give this a go. "Hoosier Cake with 'Gravy' Icing"
I found this recipe a few years ago in LOST RECIPES, by Marion Cunningham. It's a fantastic cake and a delicious icing. I was put off by the name -- gravy? -- but had come to detest icing sugar in any form so was willing to try something different. This was easy to make (but lots of beating! ), easy to work with, and delicious to eat. I think the caramel twist would also be delicious. Thank you, Dom! Do let me know how it turns out for you. B, thank you. Yes, I find the name 'gravy' icing a little offputting, too! Hi Jean! I've read so much about this kind of frosting and never been brave enough to try it. Is it really that good? I don't like what I call 'ordinary buttercream' (eg butter and icing sugar), and adore French/Swiss meringue buttercream (all that butter has to be good!) Which of those is this more like? Or should I just stop over-thinking it?! Lucy, I had to laugh -- "over-thinking" is something I'm prone to do myself! Just do it, and then tell me which you think it is more like! It *is* really good. Thanks for visiting my blog and leaving a comment. I'm glad you did because I'm now excited to discover your flour frosting. Can't wait to try it now, though not sure how well it will work as I don't have a stand mixer. Cool! I'll head over to Cranberry Morning right now! Choclette, thank you! If you have an electric hand mixer, that should work. Let me know. Good! I can be pretty bossy in the kitchen, Lucy! Greg, a lot of great cooks have that "one thing" that eludes them! But try *this* frosting! I know it is so wrong to call this a good old fashioned frosting but that is indeed what it is Jean and they just don't make them like they use to anymore!!! I can just imagine the deliciousness:) I am now craving a cupcake! Thank you so much for sharing and for stopping by my blog. I have returned from visiting my daughter from Idaho and will definitely be back at your yummy blog for more goodies! Thank you, Louise! I hope you'll try lots of my recipes and let me know how they turn out for you! Well that's something I can say I learned today... I had no idea such a thing as "flour frosting" existed. What an ingenious invention - I like your idea of cooking up the sugar with the other things so it doesn't end up all grainy, and it sounds (and looks!!!) really good. Thanks, Charles! I do hope you'll try it soon and let me know your thoughts on it! Thanks, Amy. Just looked it up. She does it the usual sugar-with-butter way. I've never even heard of flour frosting! I guess it is really like a creme patissiere? It looks wonderful! Alicia, yes, you might say the first stage is rather like an eggless crème patissiere, but the finished product (after the butter is added) is not. It's definitely a frosting. I made this yesterday and the end result was phenomenal. I did have to tweak it, I'm afraid, as the end result was super super runny. I think I added 5 cups of powdered sugar...maybe more. But we all went crazy for it. Thanks! Kerri, thanks! Glad you liked it. Can't think why it would have been runny, requiring the addition of powdered sugar, unless you didn't cook the flour mixture quite long enough. It needs to be cooked until very, very, VERY thick, almost unstirrable. I just saw this! I am so excited. I love flour frosting on red cake and on white cake with lemon filling but this version is wonderfulwith a "Autumn flavored" cake! I may even try working on combining this with parts of your Fresh Strawberry Frosting as I think the light, fluffiness would be wonderful with strawberries. I'll let you know how that worked! I didn't realize this frostings origins and this is fun to know. Thank you for posting this. Lily, thanks so much for commenting! Yes, I love this frosting on "autumn flavored" cakes, like apple (or applesauce) or carrot. If you try this with the Fresh Strawberry Frosting, do let me know how it worked. Anonymous, yes, you can use white sugar; but then you will just have regular white flour frosting *unless* you cook the sugar mixture until it darkens/caramelizes. It will be lovely on butter pecan cupcakes!